Summary: In all previous articles, given some features, such as ‘house size’, we used Tensorflow (TF) to perform linear regression to predict the outcome, such as ‘house price’, which is a numeric value. We will now look at logistic regression where given some features of an input, we will use TF to classify the input, specifically if given an input image, we are going to classify it as one of the digits of 0–9. We have learnt how to use Tensorflow (TF) to perform linear regression to predict an outcome of scalar value, e.g., house prices, given a set of features, e.g., house size. However, there are times when we want to classify things rather than predict a value, e.g., given an image of a digit we can to classify it as either 0, 1, 2, …, 9, or given a song we want to classify it as pop, rock, rap, etc. Each of the classification in the set [0, 1, 2, …, 9], or [pop, rock, rap, etc. ], is known as a class, which in the computer world we represent using a number, e.g., pop = 0, rock = 1, etc. 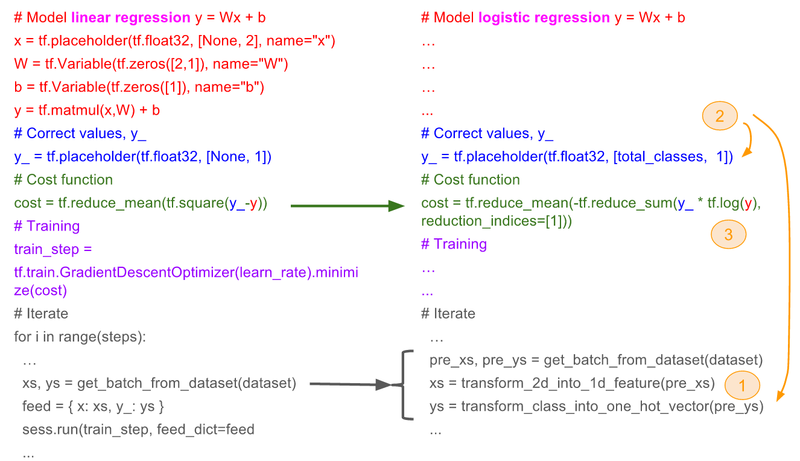 To perform classification, we can employ logistic regression using TF. In this article, we will use logistic regression to classify the image of a digit, as belonging to classes 0, 1, 2, …, or, 9. Outcome (y): For linear regression, this is a scalar value, e.g., $50K, $23.98K, etc. 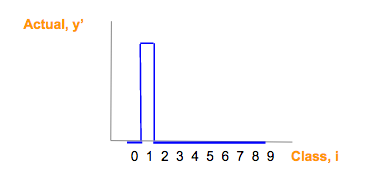 For logistic regression, this is an integer that refers to a class of e.g., 0, 1, 2, .. 9. Features (x): For linear regression, each feature is represented as an element in a column vector. For logistic regression involving a 2-D image, this is a 2-dimensional vector, with each element representing a pixel of the image; each pixel has a value of 0–255 representing a grayscale where 0 = black, and 255 = white, and other values some shade of grey. Cost function (cost): For linear regression, this is some function calculating the aggregated difference between each prediction and its expected outcome. For logistic regression, this is some function calculating the aggregation of whether each prediction is right or wrong. 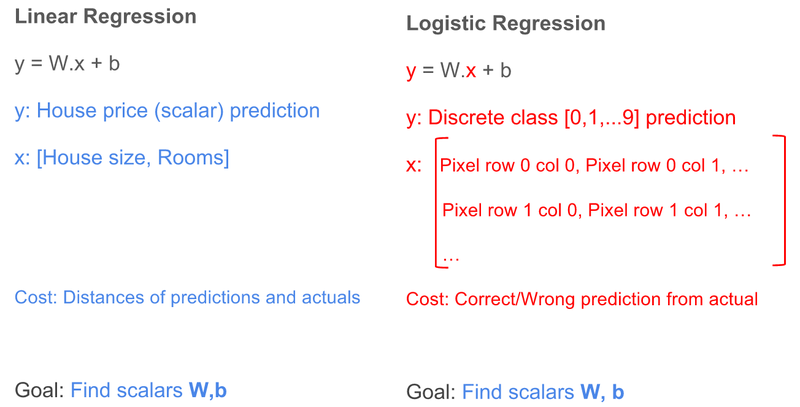 To make logistic regression work with y = W.b + x, we need to make some changes to reconcile the differences stated above. We can convert the 2-dimensional image features in our logistic regression example (assuming it has X rows, Y columns) into a 1-dimensional one (as required in linear regression) by appending each row of pixels one after another to the end of the first row of pixels as shown below. For logistic regression, we cannot leave y (predicted outcome) as a scalar since the prediction may end up being 2.3, or 11, which is NOT in the possible classes of [0, 1, …, 9]. To overcome this, the prediction y should be transformed into a single column vector (shown below as row vector to conserve space) where each element represents the score of what the logistic regression model thinks is likely a particular class. 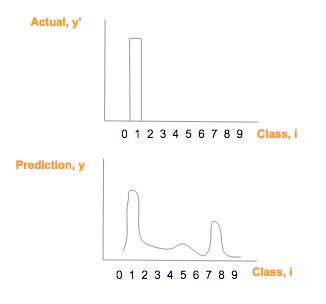 In the example below, class ‘1’ is the prediction since it has the highest score. To derive this vector of scores, for a given image, each pixel on it will contribute a set of scores (one for each class) indicating the likelihood it thinks the image is in a particular class, based ONLY on its own greyscale value. 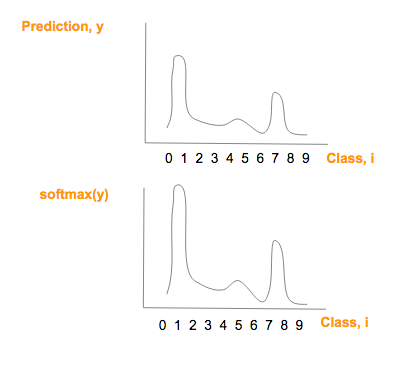 The sum of all the scores from every pixel for each class becomes the prediction vector. We cannot use as cost function, any function that involves numerical distance between predicted and actual outcomes. Such a cost function, for an image of ‘1’, will penalize a prediction of ‘7’, more heavily (7–1=6) than a prediction of ‘2’ (2–1=1), although both are equally wrong. Since we already transformed prediction (y) in to a vector of scores, we should also transform the actual image class (y’) into a vector as well; each element in the column vector represents a class with every element being ‘0’ except the element corresponding to the actual class being ‘1’. This is known as a one-hot vector. Below we show the one-hot vector for each class from 0 to 9. To mathematically compare similarity of two ‘graphs’, cross-entropy is a great way (and here is a fantastic albeit long explanation for those with a stomach for details). The actual outcome vector (y’) being one-hot vectors already satisfy these constraints. This is simply a 2-step process (see S1, S2 below), where each element in the prediction score vector (y), is exp’ed, and divided by the sum of the exp’ed total. 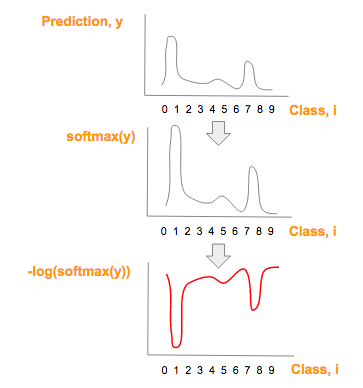 Note that softmax(y) graph is similar in shape to the prediction (y) graph but merely with larger max and smaller min values. We can now apply cross-entropy (H) between the predicted vector score probability distribution (y’) and the actual vector score probability distribution (y). The illustrations below should simplify understanding further. If you wish to fully understand why -log(softmax(y)) inverses softmax(y), the second transformation, please check out the video or slides. With the 3 proposed transformations, we can now apply the same techniques we used for linear regression, for logistic regression. The code snippets below shows a side-by-side comparison between the linear regression code from Part 3, (available here), and the changes required to make the code work for logistic regression. Cost function transformation from squared error to cross entropy. Linear regression is useful to predict outcome based on some given features, while logistic regression is useful to help classify an input given the the input’s features. We show how we can adapt linear regression’s y = W.x + b to work for logistic regression by merely transforming (1) feature vector, x, (2) prediction/outcome vector, y/y’, and (3) cost function, H.
Armed with the knowledge of one-hot vectors, softmax, and cross-entropy, you are now ready to tackle Google’s so-called “beginner’s” tutorial on image classification, which is the goal of this tutorial series.